How often do you hear … “These are the best _______ (fill in the blank) you have ever made”? Ever? I cook … a lot. My sous-chef dish-washing mom and The Chief are very kind and complimentary of my cooking. 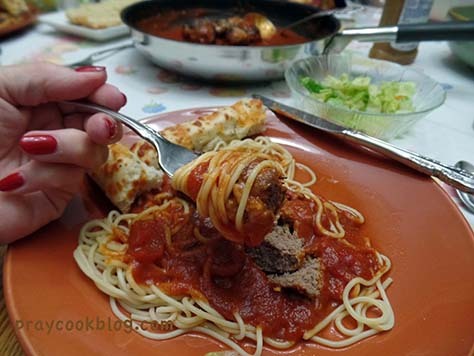 But recently I received the “these are the best meatballs you have ever made” response followed by the appropriate “yummy” and “thanks Babe!” I was so surprised and elated all at the same time. Then … a bite. And another. And another. Excitement filled the air. 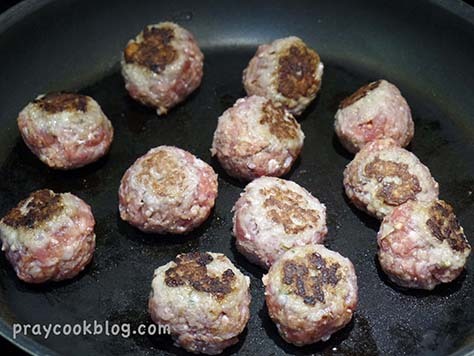 These meatballs are GREAT! I realize that I can get really, really excited over a new food discovery or just plain great food. But I am telling you now, if you don’t have a tried and true family meatball recipe, you’ve got one now! The sauce is a keeper too, but it was the meatballs that had us all swooning. It will be of no surprise that this original recipe came from Ina Garten, Barefoot Contessa on The Food Network. The recipe I am going to share is an adaptation because I don’t care for veal and her recipe included veal. I left out nutmeg and added in red pepper. I left out fresh white breadcrumbs and added in dried seasoned crumbs. I also added in some sprinkling of Italian Blend cheeses. So an adaption it is. But boy oh boy how we liked it! It is has been a couple of weeks since I made this. After writing this blog post today I can’t wait to do it again. My mouth is watering and it is early in the morning. Very early. But apparently not too early to begin dreaming of the taste and texture of these meatballs and sauce! Buon Appetito and God Bless! 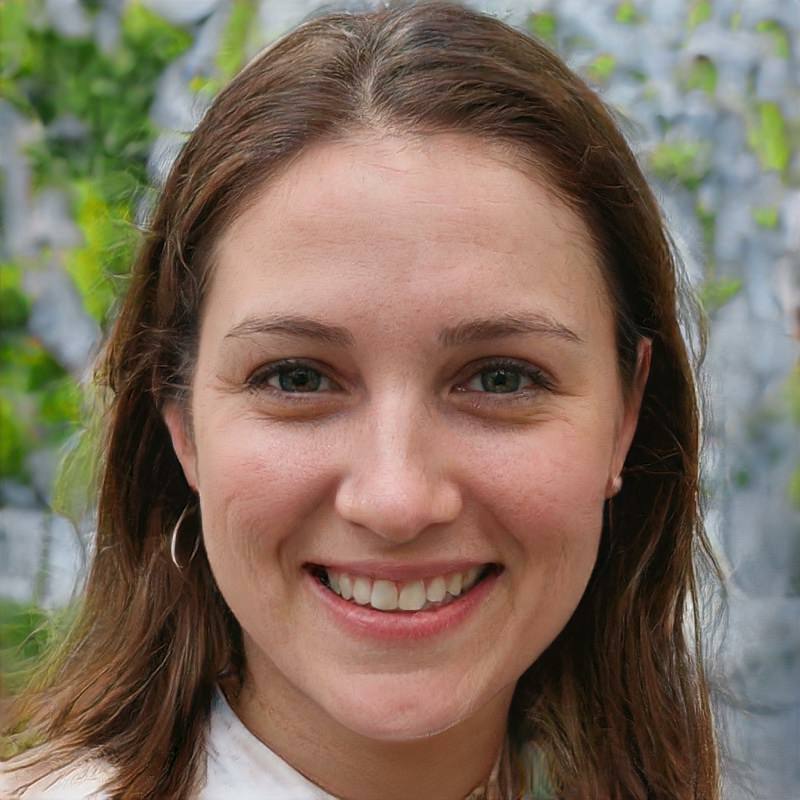 A super recipe adapted from Ina Garten. A sure family-pleaser and very easy to make! Place the ground meats, bread crumbs, parsley, Parmesan, salt, pepper, and egg in a bowl. Combine very lightly. I like to use my hands (with gloves) but you may also combine with a fork. 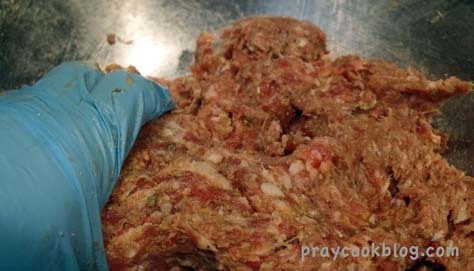 Using your hands, lightly form the mixture into 2-inch meatballs. You will have 14 to 16 meatballs. 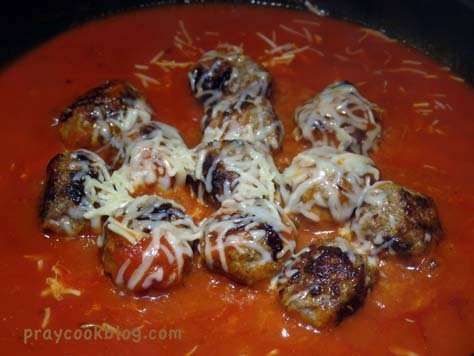 Return the meatballs to the sauce, cover, and simmer on the lowest heat for 25 to 30 minutes, until the meatballs are cooked through. Sprinkle with shredded Italian cheese. 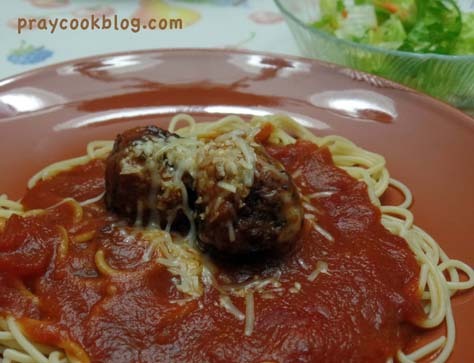 Serve hot on cooked spaghetti and pass the grated Parmesan. Adapted from Barefoot Contessa, Ina Garten.